Pembrokeshire has areas where the sky is truly dark . Pick a clear night , around the time of a New Moon . The "Philips Planisphere Disc" can be used to find the position of The Night Stars , including The Milky Way , throughout the year . The Milky Way is a spiral Galaxy , one of billions of galaxies in the universe . It is the home of our Solar System together with at least 200 billion other stars . The Milky Way is seen as a luminous band of light and stars that stretch across the night sky , from the northern to the southern horizon. It is composed primarily of stars that are too faint to be resolved so that we see their combined light as a faint glow. The centre of the galaxy lies in the direction of Sagittarius and it is here that the Milky Way looks brightest . 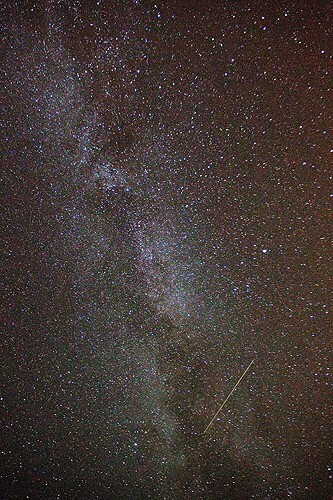 The Milky Way isn't as bright in the Winter (Oct- April) , as the view is away from the Galactic Core to the outer rim. Photo Info :- 30secs / 3200asa / f4 / 17mm Lens. A "dark frame", ie a photo taken with the Lens Cap on , is worth taking as it can be used to remove "Hot Pixels" from the photo and may help to reduce noise . For details of taking astrophotos with longer exposures , the website www.astrotrac.com , has British manufactured autoguiding gear and sample photos.